(Newser) – A Florida woman who became famous for her uncontrollable hiccupping was found guilty of first-degree murder last night and will serve life in prison without parole. 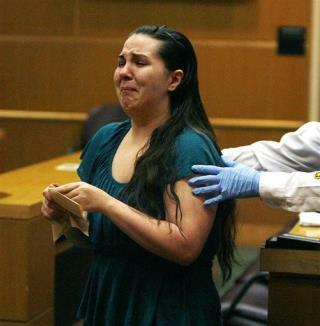 A Pinellas County jury deliberated for four hours before delivering the verdict against 22-year-old Jennifer Mee, who wept in the Clearwater courtroom as it was read. Minutes later, Judge Nancy Moate Ley explained that the only possible sentence for the charge was life in prison without the possibility of parole. Next on Newser: Singer MIA to NFL: I'm the One Who's Unwholesome? WHY did she even GO to an abandoned place! That's "trouble" right there, mj or no mj! Honestly, why don't people start using their common sense anymore??? What about her friends who help her? Did they get lift in prison too?